We woke up a 5AM, had breakfast, started hauling the anchor at 6AM and were finally underway at 6:20 (that is how long it took to hose off the anchor chain … the bottom was thick, sticky, black mud/ooze). We motored out into the Baltic with light winds, but moderate seas (leftover from Friday’s strong SW wind). By 10AM the wind had increased, so we sailed on a reach / broadreach all the way to Visby … 55 miles from our anchorage, and arrived at 3PM. It is good we arrived that early. This is a popular place. We cruised around the harbour area trying to find anyplace we could dock alongside, but were stymied. We tried calling the harbourmaster on VHF radio, but there was no response. The wind was strong enough that maneuvering in tight spaces was not desirable, so we called the harbourmaster on the mobile phone and got directions to a vacant dock just next to his office. There were plenty of folks on the quay to take lines, and we docked flawlessly. The next day we turned Pilgrim around manually so she faced the outside world for easier departure. Brian is becoming a master of this maneuver. Gotland is part of Sweden, but it is definitely not mainland Sweden. 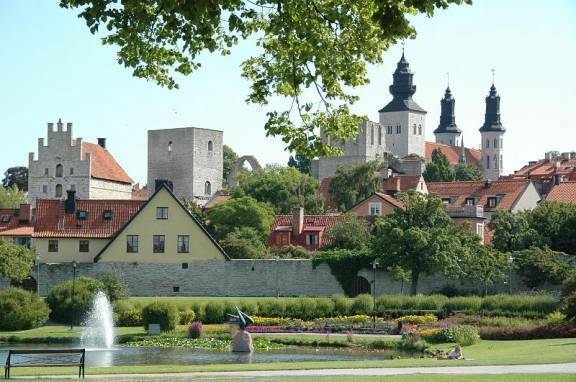 Gotland has its own flag (features a ram), In the 13th century as trade expanded east toward Russia and its rivers to Constantinople, Visby became an important Hansaetic city (the Hansaetic League being the ruling economic force in the Baltic) and its citizens became skilled merchants. Eventually the trading centre moved even further east to Tallinn. 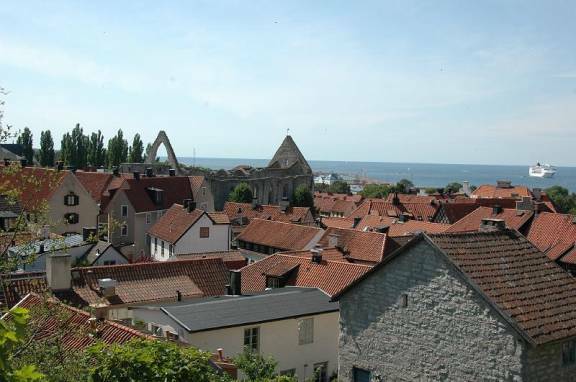 Visby is the capital, and is a walled city with many medieval buildings still standing, and some in ruins, with cobbled streets and rose bushes you would not believe. 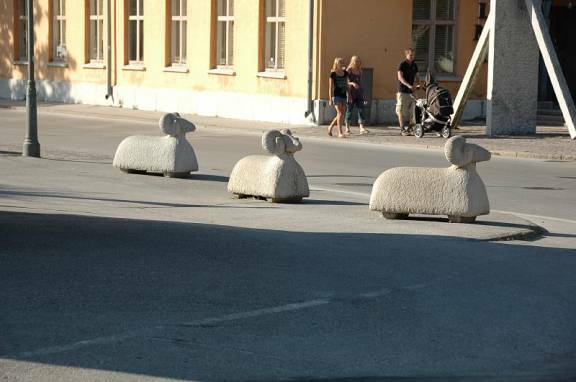 Plaster lambs and rams line the street and provide benches for passers-by. 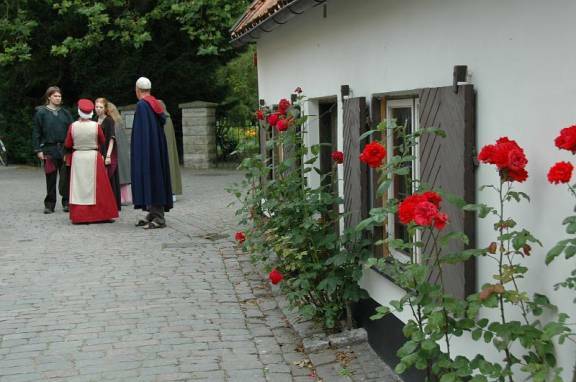 Many of the small houses have huge rose bushes outside their front doors or in small gardens. 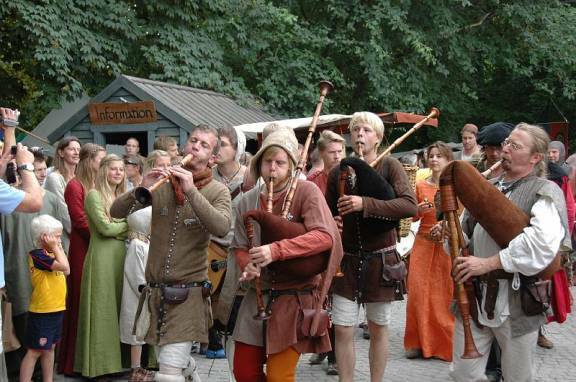 As part of Medieval Week most of the town folk dress up in period costume … up to 100,000 tourists come to participate in and/or observe the event. Note the roses growing out of the cobblestones. 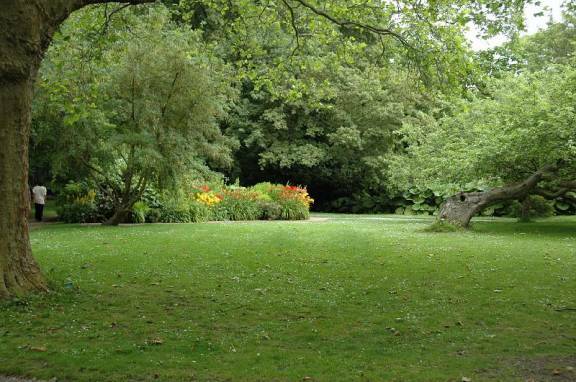 The botanical garden was laid out in 1855 by a social club of gentlemen who used to meet, have a swim and a drink and a chat. St. Catherine’s church ruin by the market square was a Franciscan abbey built in the 13th century and is the site for concerts (but none while we were in Visby). St. Mary’s Cathedral was built at the end of the 12th century and dominates the town. 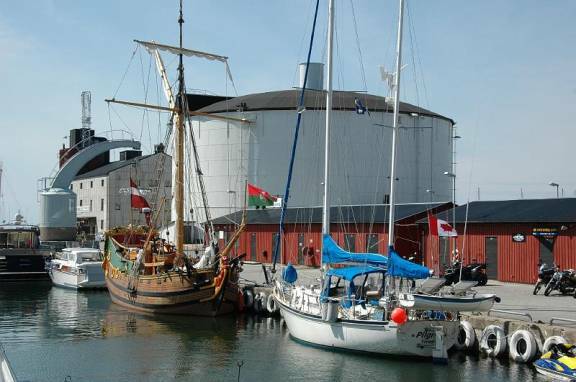 The view from its yard over the Visby is fantastic. 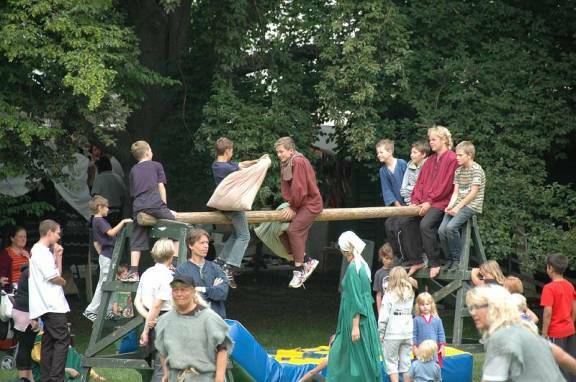 We were in Visby for part of “medieval week” and most of the townsfolk and many visitors dressed up in various types of medieval garb (medieval helmets, crossbows, axes, broadswords, peasants’ dress) and stage period drama, have parades with music, and play medieval games. 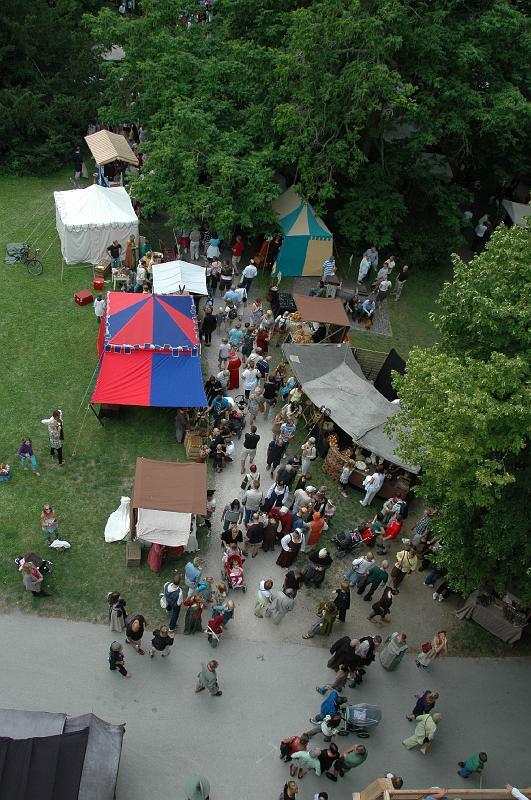 There is a huge open market of medieval fare. 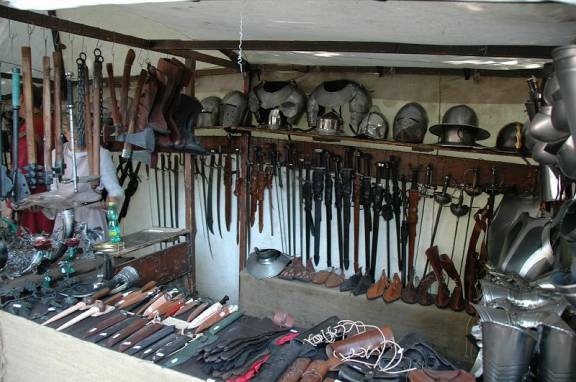 Armed combat seemed to play a major role in the activities. Kids on wooden horses hitting each other with bags of straw. 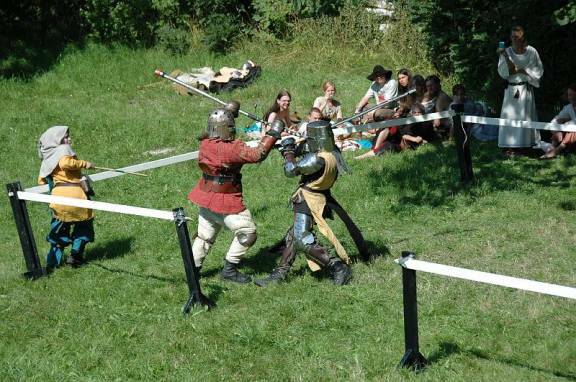 Mock wooden sword fights and real fights that could result in injury. Although we did not visit it, Fårö is an island just NE of Gotland. 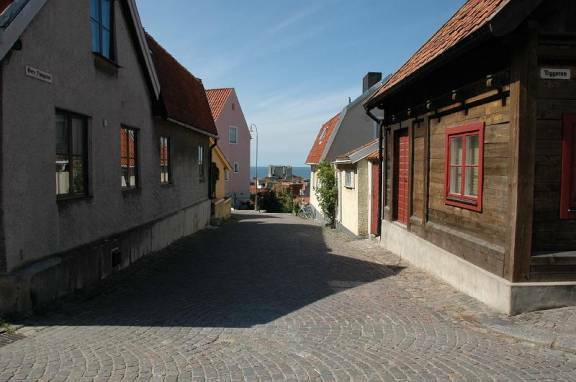 Ingmar Bergman lived there and shot several films there and on Gotland. There seem to be many artists/craftspeople living on Gotland, so there are interesting shops selling glass, ceramics, wool, sheepskins, wooden items, etc. In short, we were glad we came. We were docked right in the middle of town, close to the ferry dock. 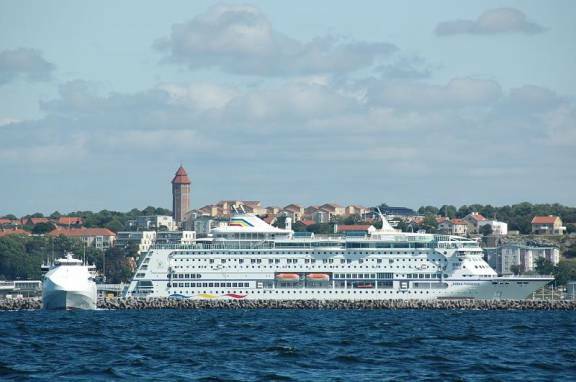 Lots of visitors walked past the boat waiting for their ferry ride back to mainland Sweden. It is amazing how many people stopped to talk to us, seeing our Canadian flag. Many lived in Canada for a while and are back in Sweden. All seem amazed we sailed from Canada to Sweden (although we keep thinking about Leif Erickson making the reverse trip without aid of GPS, charts, etc.) One person with a cottage on Gotland said we were the first Canadian boat he has seen. We sailed to Burgsvik on the SW tip of Gotland and passed Stora Karlso, an island off the west coast midway between Visby and Burgsvik. 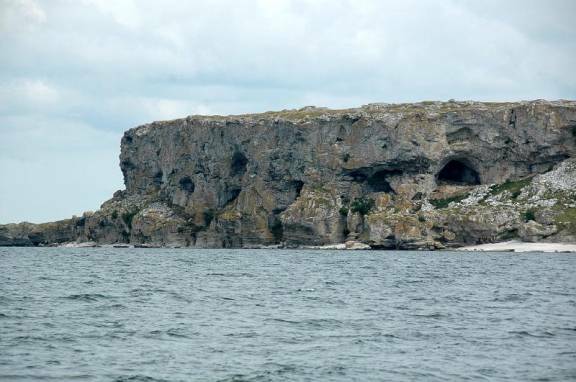 There are limestone caves on this island that were inhabited during the Bronze Age. There is so much hydro-electric power in Sweden and Finland that wind power has not been developed. 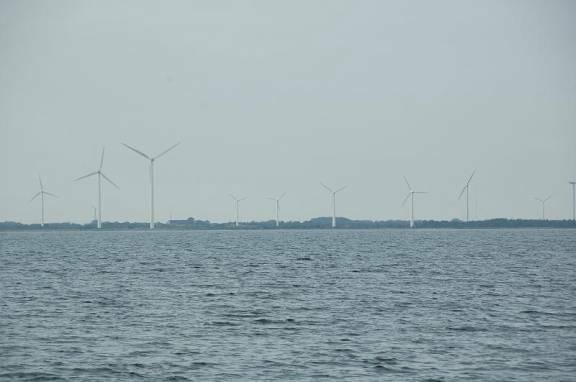 On Gotland, the situation is different, and we found large wind farms off the SW coast. 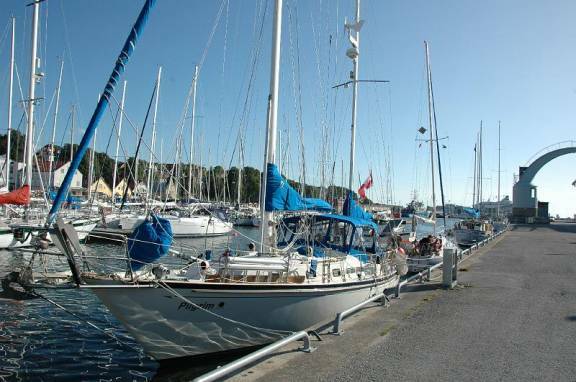 We left Gotland on Wednesday, August 5 for the 150-mile overnight sail to Poland. We were blessed with light to moderate north and northeast winds, so were able to sail most of the way.